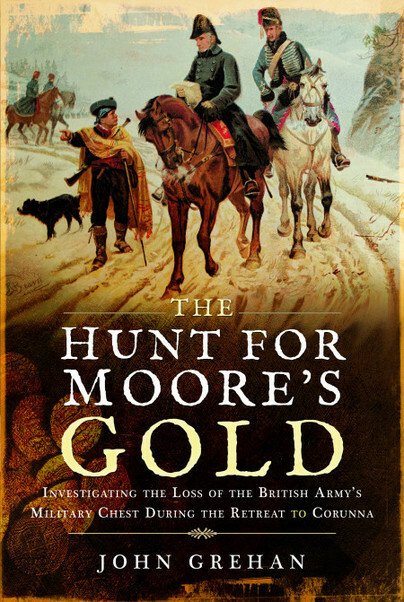 You'll be £20.00 closer to your next £10.00 credit when you purchase The Hunt for Moore's Gold. What's this? History abounds with unresolved puzzles and unanswered questions, none more so than that of the loss of the British Army’s military chest during the retreat to Corunna in 1809. Sir John Moore’s small force had dared to attack Marshal Soult’s II Corps isolated in the north of Spain. But before Moore could pounce on the unsuspecting French corps, he learnt that the Emperor Napoleon, at the head of an overwhelming body of troops, was bearing down on the British force, hoping to cut it off from the sea and its only avenue of escape. A desperate race for the coast then began, with the French hard on Moore’s heels. In sub-zero temperatures, the troops were driven on through the snow-clad Galician mountains at a punishing pace. As the men trudged on in deteriorating conditions, the bullocks pulling the army’s military chest could no longer keep up. So, in order to prevent the money from falling into enemy hands, the entire military chest was thrown down a steep, and deep ravine. What then happened to all those dollars and doubloons? Some were snatched up by the pursuing French cavalry. Some, also, were retrieved by British soldiers who intentionally lagged behind, though their greed cost them their lives on the end of a French bayonet. But what of the rest of the money? With a group of fellow historians, the author set off to search the archives and the mountains of Galicia in a bid to find Moore’s gold.